Having decided that I will not be able to sail again this year, the decision was taken to start some maintenance. The list is long! Not serious work but more preventative really. 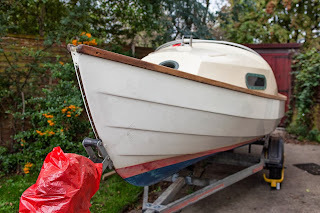 Where possible wooden parts have been removed, which makes sanding and re-varnishing a much easier job. The gunwales have been stripped back to the wood, after any fittings were removed. This also gives the opportunity to replace any brass/bronze bolts with stainless steel ones. 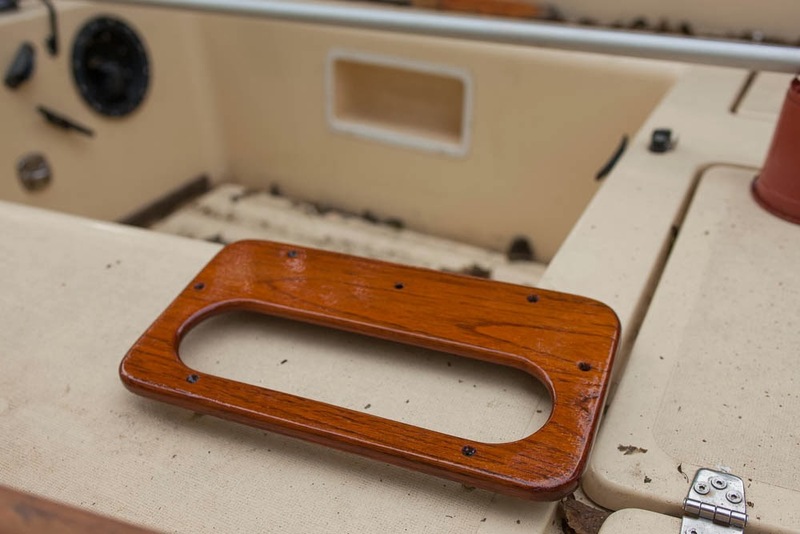 I also removed the top of the centreboard case and was relieved to see all was well with the winch and centreboard. 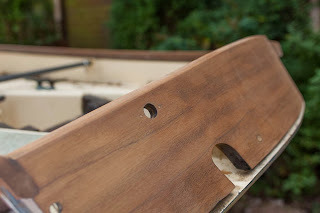 There are couple of cracks in the transom board, I'm hoping that after sanding and re-varnishing they will not increase in size. The cracks do not seem to go through to the other side, so I'm thinking they can't be too serious. I've decided to use the Deks Olje system. 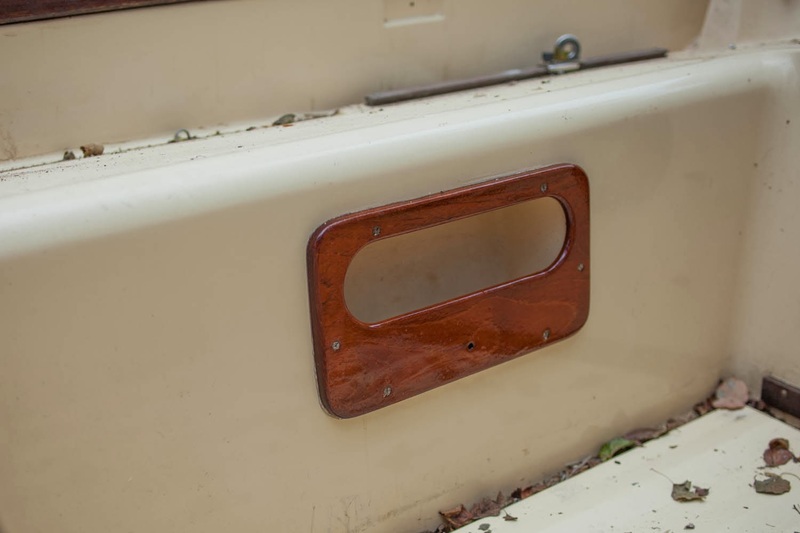 Before using it on the actual boat, I tested it on some of the smaller parts I'd previously removed. The previous owner had been pleased with the results and so far it appears to be very successful. It does tend to darken the wood but I like how it soaks in to really protect against the elements. However, time will tell how successful it really is. 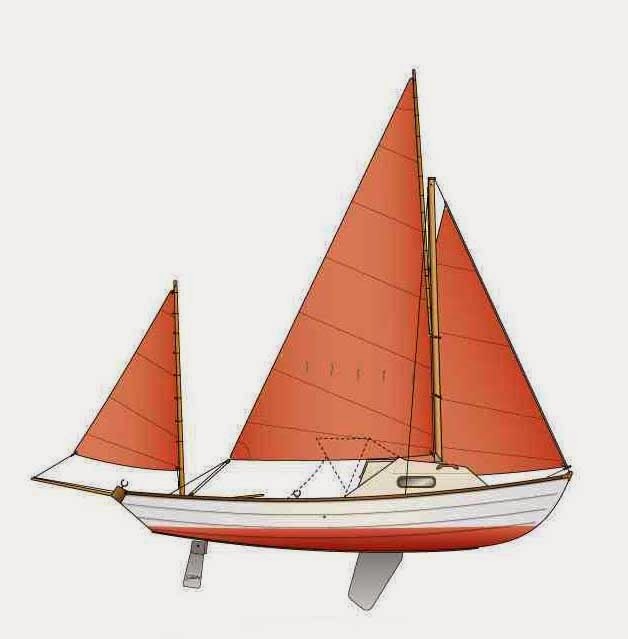 Along with the lots of smaller jobs, the larger tasks include: cleaning and repainted the rudder with Galvafroid, fitting a small battery with a solar charger and making a new curved tiller, which will clear my knees!